Technology has created enormous opportunities for SMBs in the B2B manufacturing and industrial spaces. Small companies with lean marketing budgets can achieve really (should I say literally??) amazing results with well conceived and relentlessly executed digital strategies. But many never do. Too many CEOs, presidents, founders, GMs, etc. simply don't buy the "story." You know the type - the "I've got a blackberry and that's all I want to know about technology" types. The same type that rails against the inanity of twitter (although probably without ever using it...) and other platforms. Some of it may be hang-ups or traditionalist bravado. But realistically, some of it is a reasonable response to the the not uncommon absurdity with which technology is pitched. Have you seen this video for example? Presumably a satirical look at technology in advertising, it highlights precisely why folks that make real stuff on real machines in real factories are dubious of marketing technology. "Who needs a freakin' idea these days when you've got an awesome piece of tech?" Anyway, it's easy to understand why the decision makers in B2B manufacturing companies are skeptical of industrial marketing buzz. Unfortunately that understandable response costs them growth. Some (even much) technology offers real value. Here are a couple examples - albeit ones that are often derided by the blackberry brandishing titans of industry. Video - I've written about it here before in the context of avoiding overproduction. And I've also covered the importance of providing marketing content across channels to satisfy buyers with various preferences (not everyone just wants to read whitepapers like you do!) I've even touched on the challenge facing middle aged B2B manufacturing company execs trying to empathize with the millennial engineers that they need to sell to. Well, tying all those points together is a recent article from WARC. "Online video key to reach millennials"
But sadly many companies miss this opportunity because online video gets lumped together with other less valuable bits of marketing tech. But guess what - people do sit through them. And they value them! 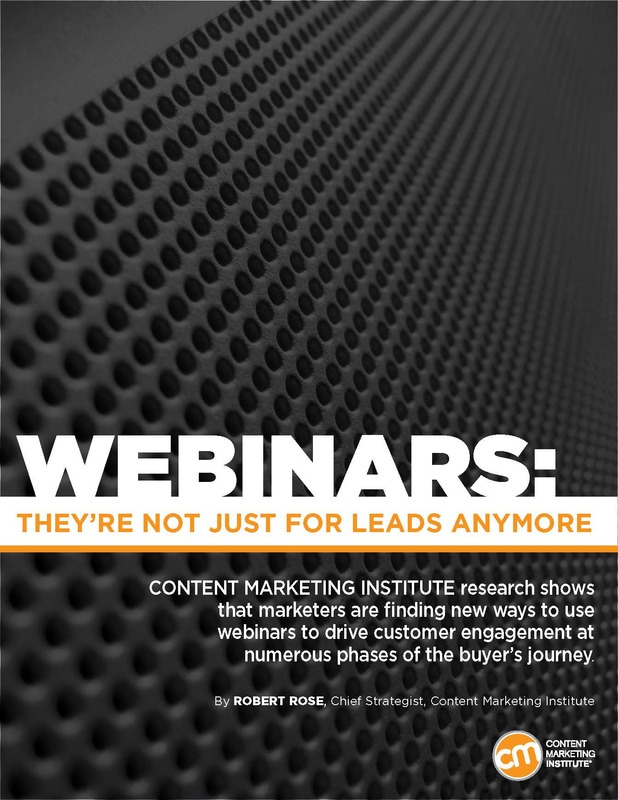 "Overall, the survey results pointed to a very clear trend: Content marketers who are finding success with webinars are broadening the scope of how they use them and are applying them across the full spectrum of the buyer’s journey." How can companies leverage the technology that works without wasting resources on the absurd? That's part of the role of good partners. Capable marketing advisors who have owned businesses, have deep experience in B2B manufacturing, and have extensive experience selling to the right buyers will survey and monitor evolving tech. They'll intuitively recognize tools that can be productively used while avoiding the gimmicks. And they'll design the manufacturing companies' B2B marketing programs to integrate those tools where appropriate. Seems like a straightforward choice, don't you think?